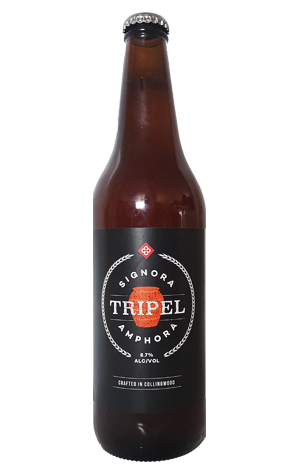 The Craft & Co’s Amphora Tripel is one of a few firsts for the small Collingwood outfit. It’s the first of the brewery’s beers to be released into bottleshops and also the first Australian beer brewed with clay to be bottled too. Having brewed Australia’s first amphora beer as a limited run for Good Beer Week, The Craft & Co proceeded to look for the style which could showcase the effects the terracotta pots had on a beer’s yeast profile. So, with Belgian beers known for their fruity, spicy aromas and flavours, it was hard to pass over a Tripel for this little moment of history. Once in your glass, for the most part, it’s very clearly a Belgian style beer, with a combination of sweet, rich fruit and spice characters making their presence felt. As the beer warms, some citrus fruit joins the blend of flavours, supported by a soft malt body. In terms of the amphora making its presence known, it has pulled back some of the bittering qualities of the hops while leaving the floral flavours intact while also lending the beer a sprightly mineral quality to its finish.